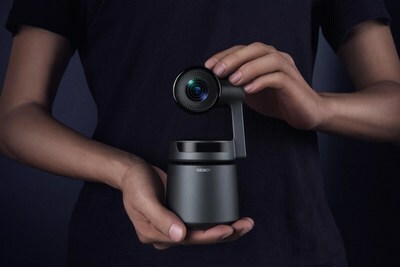 SAN FRANCISCO, Jan. 15, 2019 /PRNewswire/ -- Remo Technology, the creator of AI video camera, announced the pre-order of OBSBOT Tail, the world's first Auto-Director AI camera, on Kickstarter. Heralded by Variety as an "Innovation that Stole the Show," the OBSBOT Tail uniquely offers AI features that track and record you without a camera man, whether you're dancing, skateboarding or vlogging. The OBSBOT Tail is now available for pre-order on Kickstarter at an early bird price of $469 USD. "We've received overwhelming interest in OBSBOT Tail for its groundbreaking innovations in filmmaking," said Bo Liu, CEO and Founder of Remo Technology. "And we're excited to finally make OBSBOT Tail available for pre-order on Kickstarter." Power Gesture - OBSBOT Tail's gesture recognition technology enables a stable and accurate gesture control within up to 6m (Wide) to 20m (Tele) distances. Eureka Moment -OBSBOT Tail's integrated video analytic technology will analyze the video recording in real time, and recommend the highlight clips for you once finished. Remo Technology is a camera company dedicated to pushing the boundary of camera industry with new ideas and technologies including AI. The product enables everyone to be their own actor, cameraman and director all at the same time.